Depressants cause the body to relax by increasing the neurotransmitter GABA, which decreases neuronal excitability. Depressants do not directly reduce arousal in the brain; they enhance the activity of a neurotransmitter that reduces arousal in the brain. The main types of depressants are alcohol, barbiturates, benzodiazepines, cannabinoids, and opioids. Examples of common depressants include pain killers and social- anxiety medications, which have similar effects on the brain. ataxia: Lack of coordination while performing voluntary movements, which may appear to be clumsiness, inaccuracy, or instability. anxiolysis: The reduction of anxiety by means of sedation or hypnosis. A depressant (also called a central depressant) is a chemical compound that manipulates neurotransmission levels, thereby reducing arousal or stimulation in various parts of the brain. Depressants are also occasionally referred to as “downers” because they lower the level of arousal in the brain when taken. Stimulants, or “uppers,” which increase mental and/or physical function, are the functional opposites of depressants. Depressants are widely used throughout the world as prescription medicines and as illicit substances. Effects often include ataxia, anxiolysis, pain relief, sedation or somnolence, and cognitive/memory impairment; in some instances, effects include euphoria, dissociation, muscle relaxation, lowered blood pressure or heart rate, respiratory depression, anticonvulsant effects, and even complete anesthesia or death. Calming effects of depressants may be beneficial to those suffering from anxiety, sleep disorders, or pain; however, the more extreme effects can be dangerous and even life-threatening. On the neural level, most depressants act on the brain by affecting the neurotransmitter gamma-aminobutyric acid (GABA), which is responsible for regulating (specifically, decreasing) neuronal excitability throughout the nervous system. Neurotransmitters are brain chemicals that facilitate communication between brain cells. Depressants inhibit the next neuron from sending impulses by binding to receptor molecules. Although the different classes of depressants work in unique ways, it is through their ability to increase GABA—and thereby inhibit brain activity—that they produce a drowsy or calming effect. Though initially a stimulant, alcohol ultimately depresses the brain, resulting in relaxation and impaired judgment. Alcohol as a depressant: Alcohol depresses the brain, resulting in relaxation and impaired judgment. Barbiturates are effective as anxiolytics, hypnotics, and anticonvulsants, and also have an analgesic (painkiller) effect. However, they are commonly misused, physically addictive, and have serious potential for overdose. In the late 1950s, it became clear that the social cost of barbiturates was beginning to outweigh the medical benefits, which sparked a serious search for a class of replacement drugs. Most people still using barbiturates today do so to prevent seizures or for relief of migraine symptoms. Barbiturates have been largely replaced by benzodiazepines, because the latter have fewer side effects and less potential for lethal overdoses. However, barbiturates are still used as anti-convulsants (e.g., phenobarbital, an anti-seizure medication), as sedatives (e.g., sodium thiopental), and analgesics for cluster headaches and migraines (e.g., Fioricet). Benzodiazepines enhance the effect of the neurotransmitter gamma-aminobutyric acid (GABA) at the GABA receptor, resulting in sedative, hypnotic (sleep-inducing), anxiolytic (anti-anxiety), anticonvulsant, and muscle-relaxant properties. Amnesic-dissociative actions are also seen in the applied pharmacology of high doses of many shorter-acting benzodiazepines. These properties make benzodiazepines useful in treating anxiety, insomnia, agitation, seizures, muscle spasms, alcohol withdrawal, and as a premedication for medical or dental procedures. Some of the most common benzodiazepines are anti-anxiety medications, such as clonazepam (Klonopin), alprazolam (Xanax), diazepam (Valium), and zolpidem (Ambien). Although cannabis or marijuana is often considered either in its own unique category or as a mild psychedelic, the drug—notably the chemical compound cannabidiol that it contains—nevertheless has many depressant effects such as muscle relaxation, sedation, decreased alertness, and tiredness. There are at least 85 different cannabinoids isolated from cannabis, the most common of which is THC, the active ingredient in marijuana. Cannabinoids can be administered by smoking, vaporizing, oral ingestion, transdermal patch, intravenous injection, sublingual absorption, or rectal suppository. Once in the body, most cannabinoids are metabolized in the liver. An opioid is any psychoactive chemical that resembles morphine or other opiates in its pharmacological effects. One of the oldest known drugs, opioids induce an analgesic (painkiller) effect by decreasing perception of pain, decreasing reaction to pain, and increasing pain tolerance. Known for their highly addictive quality, opioids work by binding to opioid receptors, which are found principally in the central and peripheral nervous system and the gastrointestinal tract. Opioids are among the world’s oldest known drugs; therapeutic use of the opium poppy predates recorded history. The most common opioids in modern history are morphine, heroin, and codeine, which are known as incredibly effective, albeit addictive, painkillers. As opposed to these naturally occurring opioids that are derived directly from the resin of the poppy plant, synthetic opioids are synthesized chemically in the laboratory and are agents commonly used in pain relief, treating drug dependence and anesthesia. Some examples include hydrocodone and oxycodone. The term “narcotic” originally referred medically to any psychoactive compound with sleep-inducing properties. In the United States, it has since become associated with opioids, commonly morphine and heroin and their derivatives. The term is, today, imprecisely defined and typically has negative connotations. When used in a legal context in the United States, the term “narcotic drug” refers to a substance that is completely prohibited, or one, such as codeine or morphine, that is used in violation of governmental regulation. From a medical standpoint, it is no longer a useful term. Stimulants induce temporary improvements in mental and/or physical functions and are commonly used as prescription or recreational drugs. Stimulants increase the activity of the central nervous system, the sympathetic nervous system, or both. Most stimulants work by facilitating the activity of certain neurotransmitters, such as dopamine or norepinephrine. Stimulants are often used medically to boost endurance, counteract fatigue, promote weight loss, improve mood, or relieve anxiety; they are also often used to treat conditions such as narcolepsy, ADHD, and certain forms of depression. Examples of well-known stimulants include amphetamines, MDMA, NDRIs, cocaine, caffeine, and nicotine. neurotransmitter: Any substance, such as acetylcholine or dopamine, responsible for sending nerve signals across a synapse between two neurons. dopamine: A neurotransmitter associated with movement, attention, learning, and the brain’s pleasure and reward system. narcolepsy: A disorder characterized by sudden, uncontrollable, and often brief attacks of deep sleep, sometimes accompanied by paralysis and hallucinations. Stimulants are psychoactive drugs that induce temporary improvements in mental and/or physical functions. Occasionally referred to as “uppers,” stimulants are the functional opposites of depressants, or “downers,” which decrease mental and/or physical function. Stimulants are widely used throughout the world as prescription medicines and as illicit substances of recreational use or abuse. Stimulants increase the activity of the central nervous system (the brain and spinal cord), the sympathetic nervous system (part of the peripheral nervous system that controls the fight-or-flight response), or both. Common effects, which vary depending on the substance in question, may include enhanced alertness, awareness, wakefulness, endurance, productivity, and motivation. Effects can also include an increase in arousal, locomotion, heart rate, and blood pressure, and the perception of diminished requirements for food and sleep. Some stimulants produce a sense of euphoria, especially those that exert influence on the central nervous system. Stimulants exert their effects through a number of different mechanisms. Some stimulants facilitate the activity of certain neurotransmitters, specifically norepinephrine and/or dopamine. Others block the action of certain receptors (such as the adenosine receptors) in a process known as receptor antagonism. Still others cause action in other receptors (such as nicotinic acetylcholine) in a process known as receptor agonism. Therapeutically, stimulants are used and/or prescribed for a variety of reasons. They are used to increase or maintain alertness; to boost endurance or productivity; to counteract fatigue and lethargy throughout the day; to counteract abnormal states that diminish alertness or consciousness (such as in narcolepsy); to decrease appetite and promote weight loss; and to enhance concentration (especially for those with attentional disorders such as ADHD). Many stimulants are also capable of improving mood and relieving anxiety, and are occasionally used to treat symptoms of depression. The euphoria produced by some stimulants leads to their recreational use, so many stimulants are either illegal or very carefully controlled in the United States. Some may be legally available only by prescription. Addiction to some central-nervous-system stimulants can quickly lead to medical, psychiatric, and psychosocial deterioration. Drug tolerance, dependence, sensitization, and withdrawal can occur after repeated use. Over time, stimulants can disrupt the functioning of the brain’s dopamine system, dampening users’ ability to feel any pleasure at all. Amphetamines (such as ephedrine and methamphetamine) are a group of stimulants that increase the levels of norepinephrine and dopamine in the brain through reuptake inhibition—meaning they block these neurotransmitters from being reabsorbed back into the neural networks. Amphetamines are known to cause elevated mood and euphoria, and are often used for their therapeutic effects. Physicians occasionally prescribe amphetamines to treat major depression, and numerous studies have demonstrated the effectiveness of drugs such as Adderall in controlling symptoms associated with ADHD. Due to their availability and fast-acting effects, amphetamines are prime candidates for abuse. Methylenedioxymethamphetamine (MDMA), known by its common street names Ecstasy and Molly, had a medical application as a treatment for depression and a psychotherapy aid until 1985, when it became a controlled substance. The stimulant effects of MDMA include appetite loss, euphoria, social disinhibition, insomnia, improved energy, increased arousal, and increased perspiration. MDMA also has many physical side effects: since MDMA increases the activity of serotonin, the brain becomes depleted of serotonin, causing a rebound sadness or depression in the days following use. MDMA differs from most stimulants in that its primary pharmacological effect is on the neurotransmitter serotonin rather than dopamine, epinephrine, or norepinephrine. MDMA also decreases the release of dopamine. The increase in seratonin is caused because the MDMA prevents seratonin from entering the reuptake site, causing a continued flow, and eventually excess seratonin. Norepinephrine and dopamine reuptake inhibitors (NDRIs) (such as the antidepressant Wellbutrin) inhibit the uptake of dopamine and norepinephrine, effectively increasing their amounts in the brain and causing a stimulating effect. Many of these compounds are effective ADHD medications and antidepressants. These medicines have an extended release mechanism, and are typically less popular for recreational use. Cocaine: Cocaine, in powder form, is a commonly abused stimulant that produces a sense of euphoria in the user. Cocaine is made from the leaves of the coca shrub, which grows in the mountain regions of South America. 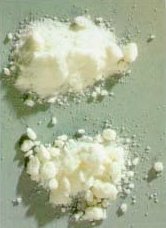 In Europe and North America, the most common form of cocaine is a white crystalline powder. Most cocaine use is recreational and its abuse potential is high, and so its sale and possession are strictly controlled in most jurisdictions. Caffeine is a drug that is found naturally in coffee, tea, soft drinks, and cocoa. Caffeine stimulates the body, increases heart rate and blood pressure, and facilitates alertness and concentration. The vast majority (over 80%) of people in the United States consume caffeine on a daily basis. In very low concentrations, nicotine also acts as a stimulant, and it is one of the main factors responsible for the dependence-forming properties of tobacco. Hallucinogens affect the levels of serotonin or glutamate in the brain and are divided into psychedelics, dissociatives, and deleriants. Hallucinogens are drugs that alter sensory input to the brain. They are divided into three categories: psychedelics, dissociatives, and deliriants. Psychedelics work by interacting with serotonin receptors in the brain and produce a state of empathetic well-being and visual distortion. Dissociatives are a subclass of hallucinogens that work by blocking or altering sensory perception. Deliriants are very similar to dissociatives; they are considered to be “true hallucinogens” because the visuals they produce are hard or impossible to distinguish from reality. Common hallucinogens include MDMA, PCP, and LSD. LD50: In toxicology, the median lethal dose of a toxin, radiation, or pathogen required to kill half the members of a tested population after a specified test duration. antagonist: A chemical that binds to a receptor but does not produce a physiological response, thereby blocking the action of agonist chemicals. glutamate: An important neurotransmitter that plays a key role in long-term potentiation and is important for learning and memory. serotonin: An indoleamine neurotransmitter (5-hydroxytryptamine) that is crucial in maintaining a sense of well-being and security and is involved in depression. Hallucinogens are drugs that alter sensory input to the brain. This creates an altered sense of reality, as well as a change in emotions and thought patterns. Hallucinogens can connect the conscious mind to the unconscious, delivering thoughts and feelings that would otherwise remain out of our conscious awareness. 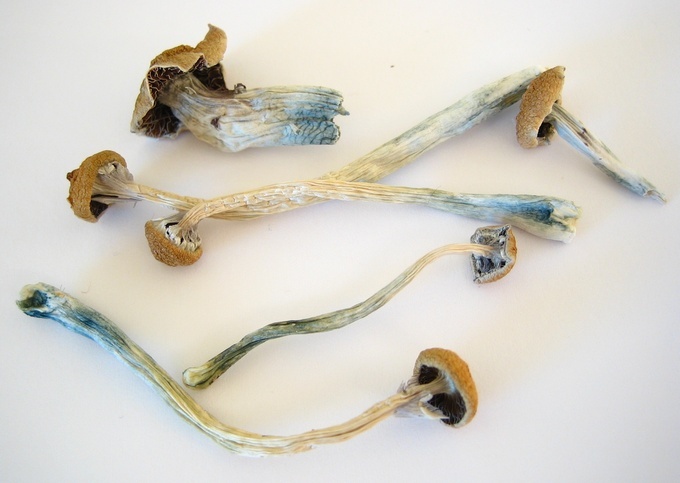 Naturally occuring hallucinogen: Hallucinogenic mushrooms often have a characteristic blue bruising on their stems. Hallucinogens are divided into three categories: psychedelics, dissociatives, and deliriants. Psychedelics are distinguished from the other two subclasses by their lack of addictive qualities, as well as the remarkable experiences one may have under their influence. Most (but not all) psychedelics are non-toxic and have a very high LD50. This means that the user would have to ingest or take very large amounts of the drug, many times that of a recreational dose, in order to kill themselves. The resulting experiences, however, can be extremely overwhelming, often driving users to seek emergency assistance. Most psychedelics work by interacting with serotonin receptors in the brain. Effects include increased breathing and heart rate, dilated pupils, dehydration, increased color perception, a state of empathetic well-being (feeling as though one is at peace with everyone and everything), and visual distortion: things may appear to move, shapes may appear on textures and exhibit a kaleidoscope-like effect, or lighting may dramatically change for no apparent reason. Dissociatives are a subclass of hallucinogens that work by blocking or altering sensory perception (including senses that are perceived by the unconscious mind), creating a feeling of disconnection and depersonalization from one’s body and reality in general. Many dissociatives are strong depressants, and large doses can slow down the heart or breathing to the point of causing death. Generally they are not physically addictive, but can be habit forming if used repeatedly in a short time span. Most dissociative drugs simulate a dream-like experience. As with psychedelics, a mixing of the senses can lead users to believe they can see sounds or taste textures. Primary dissociatives are NMDA antagonists, which block glutamate from entering its receptors and regulating brain function. Deliriants are very similar to dissociatives, and are considered to be true hallucinogens because the visuals they produce are hard or impossible to distinguish from reality. Under their influence, users will often have entire, rational conversations with people who aren’t actually there. Some people may see their own reflection and believe it is another person copying their actions. Users often retain awareness of their physical surroundings, but are consciously impaired. Almost all deliriants are toxic enough that there is a very small difference, in terms of quantity used, between a recreational dose and a lethal one. Both Benadryl and Dramamine are deliriants when taken in extremely high quantities. Deliriants work by inhibiting acetylcholine, a neurotransmitter responsible for cognition and stimulation. By contrast, when you drink a cup of coffee, your acetylcholine increases, leading to enhanced alertness and focus. Psilocybin mushrooms, also known as “shrooms,” are mushrooms that contain the psychedelic compounds psilocybin and psilocin. They are mainly used as recreational drugs, whose effects include euphoria, altered thinking processes, closed- and open-eye visuals, synesthesia, an altered sense of time, and spiritual experiences. LSD, also a psychedelic, blocks serotonin from the brain, which regulates mood, perception, muscle contraction, and other cognitive functions. LSD blocks serotonin because it is, structurally, similar to serotonin. For this reason, the brain mistakes LSD for serotonin and directs it to the synaptic cleft (instead of actual serotonin). LSD causes a number of alterations in perception by affecting both cognitive and visual sensory systems, and it changes the sense of time, body-image, and ego. Memory is also greatly affected. A typical “trip” can last anywhere between six and ten hours. PCP (or angel dust), a dissociative, prevents the actions normally caused when a neurotransmitter called glutamate is able to attach to its receptor in the brain. It also disrupts the actions of other neurotransmitters. This drug is addictive, and its effects are very unpredictable. For example, it may make some people hallucinate and become aggressive, while others may become drowsy and passive. Dextromethorphan is the active ingredient in most over-the-counter and prescription cough medicines. When used in excess of specified maximum dosages, dextromethorphan acts as a dissociative. It can produce effects similar to the dissociative states created by other dissociative anaesthetics such as ketamine and phencyclidine. Nitrous oxide, commonly known as laughing gas, is used in surgery and dentistry for its anaesthetic and analgesic effects. It is known as laughing gas due to the euphoric effects of inhaling it, a property that has led to its recreational use as a dissociative hallucinogen. While deliriants are often naturally occuring (in plant species), synthetic compounds such asdiphenhydramine (Benadryl) and dimenhydrinate (Dramamine) are also deliriants. Uncured tobacco is also a deliriant due to its very high nicotine content, resulting in a delirious hallucinogenic intoxication. Despite the fully legal status of several common deliriant plants, deliriants are largely unpopular as recreational drugs because of their unfavorable effects.